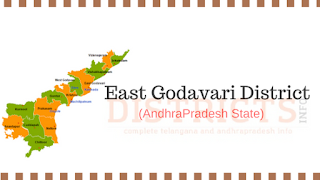 East Godavari District Profile: East Godavari district has a special place in south Indian history. Rajahmundry town in the district played a major role politically, economically, socially and culturally in the history. Godavari district was divided into East and West Godavari districts in 1925. The area of East Godavari district is 10807 square kilometers. Head quarter of the district is Kakinada. The borders are Visakhapatnam on north, West Godavari in west, Bay of Bengal in east and south. Yanam that belongs to Pondicherry is in West Godavari district. Rajahmundry is the biggest town in the district. There are 5 revenue divisions, 60 mandals and 1011 gram panchayats. There are also 19 assembly and three parliamentary constituencies. Assembly constituencies are Tuni, Prattipadu, Pitapuram, Kakinada rural, Peddapuram, Anaparti, Kakinada town, Ramachandrapuram, Mummidivaram, Amalapuram, Rajol, P.Gannavaram, Kottapeta, Mandapeta, Rajanagaram, Rajahmundry town, Rajahmundry rural, Jaggampeta, Rampachodavaram and the parliament constituencies are Kakinada, Amalapuram and Rajahmundry. East Godavari District history is available since the ruling of Nanda kings. This region is also ruled by Mouryas, Sathavahanas, Gupta kings, Vishnukundins, Badami Chalukyas, Kakatiyas and Musunoori Reddys. It was also under the rule of Golconda Sultans and Britishers. After independence this region was a part of Madras state, in Andhra state during 1953-56 and then in Andhra Pradesh. After bifurcation of Andhra Pradesh in 2014, it is now one of the 13 districts in Andhra Pradesh. East Godavari district tourist places are as follows: 1)Annavaram is a popular temple in East Godavari district. The presiding deity here is Sri Veera Venkata Satyanarayana Swamy. Thousands of devotees visit the temple every day. 2)Draksharamam has a temple for Lord Shiva, Lord Vishnu and this is also one of the Shaktipeetham. 3)Kumaraaraamam is in Samalkota, East Godavari district. Presiding deity here is Someswara along with Balatripura Sundari. Samalkota is 60 km away from Rajahmundry. 4)Antarvedi is another religious place in the district. This is where Godavari meets the sea. There is a temple for Sri Lakshmi Narasimha Swamy and this is also one of the famous tourist places. 5) Maredmilli is at a distance of 80 kilometers from Rajahmundry. There is Jalatarangini waterfall nearly which is an attraction. 6)Papikondalu is another very famous tourist attraction. 7)Kadiyam is famous for its plant nurseries. Many types of flowers and plants are created here. This is at a distance of only ten kilometers from Rajahmundry. 8)Dindi resorts are located at a place where River Godavari meets the sea. This place is near Rajol and house boats are additional attraction of this place.